Our tasting room and patio are located above the vineyard with stunning views. 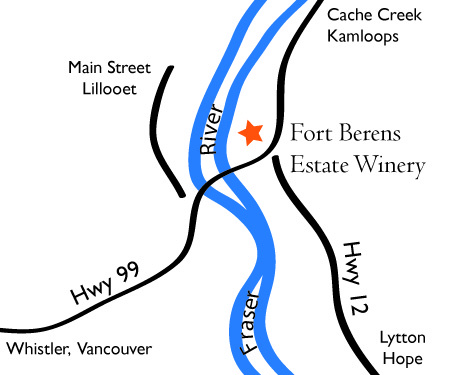 Fort Berens Estate Winery is less than two hours north of Whistler, three and a half hours from Vancouver and two hours south-west of Kamloops, on the scenic Highway 99 route from the west coast to the interior. It marks the halfway point of the beautiful Coast Mountain circle tour over Highways 99, 12 and 1 from Vancouver.